A walk around the block with my daughter took an hour when she was a toddler. She was so fascinated by every fallen leaf, roly-poly bug or passing neighbor that a walk with her was like standing on the deck of a slow-moving ocean liner. Any adult who has ever gone for a stroll with a toddler knows the routine. Lately, I’ve been transported back to those lumbering walks. This time, I’m the toddler, hobbling around the block, walking tenderly as part of my recovery from a hip injury. On a recent walk, the wonder of the world opened up to me much like it must have for my daughter. Just walking was a bit of a marvel. When you can’t walk well, you’re amazed and deeply appreciative of the physical symphony it takes to propel you forward. But I was also amazed by the crisp sunshine and how it painted the sky a technicolor blue. I was amazed by the wind that arrived out of nowhere and rippled through the streets like an invisible tide. Everything around me seemed so strange and beautiful. I found myself collecting odd, prehistoric pods that fell from a tall tree and greedily stuffing them in my pockets. For a while after arriving home, I held the joy of that walk like an egg in my hands, knowing it was fragile. I knew that even if I wanted to recreate it I couldn’t because it was part of a healing that would mend me. Soon, I would be back to my fast-walking ways. And, yet, a teaching from that walk remains. While all experiences are fleeting, they leave traces like contrails from jet planes. The contrail from that walk is that there is goodness everywhere if you make a point of noticing it. Yes, even in these upsetting polarized times there is goodness. You’ll find it in nature. You’ll see it in me, in yourself and in everyone around you. “Good facts abide and abound no matter how obscured,” writes meditation teacher and psychologist Rick Hanson. So, look for goodness. Choose it. Catch yourself hurrying along and slow down. One way to enjoy the subtle goodness in our everyday life is to come in contact with something sensory and to drink it in like soup from a ladle. Some ideas: Savor the flavor of a juicy orange, listen to the laughter of your children in the next room, see the smile on the face of the cashier at Trader Joe’s. Even the low-down feeling of your feet in your shoes can be immensely good when your mind is whirling like a fan with worries. Hanson wrote a useful book on how to make this a mindfulness practice. It’s called Hardwiring Happiness: The New Brain Science of Contentment, Calm and Confidence. Here’s how one woman told him she made a habit out of it. What’s the point of mindfulness if not to make us more present for each other? 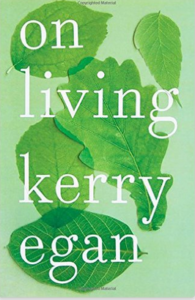 Kerry Egan’s book On Living beautifully explores this terrain by chronicling the stories and wisdom from those nearing the end of their lives. Far from maudlin, Egan’s book is a celebration of the poignancy that unfolds when you bring your full, listening self to others. Egan writes not so much about death, but about the varied and curious journeys we all take to arrive at our final destination. Watch Danny MacAskill’s unbelievable bike ride through rural Edinburgh and be struck with awe. Dedicated Practice + Focused Attention = Joyful Flow.